The government’s deputy- directors of department of each ministries / institutions have spent their time on missions to visit people to attract popularity during weekends and working days. That is in order to strengthen their party at grassroots level. The money is spent through the national level or from the party on gasoline, foods, hotel and participants. Has the government ever assessed the expenditure of such missions of the national level? Based on the Cost-and-Effect Analysis, which one sounds more effective, between going on the mission just to distribute gifts and talk to people, or decentralizing the power and resources to those working in the districts/municipalities and commune levels who work closely with the local people? Often there are some complaints and urges by The National Committee for Sub-National Democratic Development (NCDD), under the supervision Sor Kheng, Deputy-Prime Minister and Minister of Interior, that the activities of the decentralization are behind the plan of the IP3 Implementation Phase 3 project from 2010 to 2019. Sar Kheng last week criticized the ministries who have played a role in transferring the powers and functions to the sub-national level very slow, as it affects the core of the D&D reform. Since 2015, Prime minister Hun Sen has pushed such functional reassignment, saying that at least a function in all Ministries needed to be transferred to their sub-national level by the end of 2015. So far the goal has not been reached. In theory, decentralization is aimed to transfer not only the functions and human resources but also the budget. “Decentralization refers to the transfer of ownership over authorized functions and resources to respond to the local needs. The council is accountable for the issue for the sakes of the local people,” says the Provincial/Capital, District/Municipality, and Commune/Sangkat management law. District/Municipality administrations, who represent their councils, have received the budgets for funding their operations but not the budgeting for transferring function and resources. Some, such as the health, education, and environment sectors, though in their first step in doing it, are just pilot projects. According to sub-decree No. 36 about the District/Municipal Fund Management and its process issued in 2013, the D/M fund received 0.8 percent of previous year current revenue in 2012 and variance the economic growth. In 2013, D/M fund received USD 17 million compared to in 2017, where the D/M fund will raise USD 33.5 million (MoEF, 2016). But it is not unusual to them. There is the complaint over the inadequate budget from the D/M administrations; not even enough to spend on governing their authorized territories due to the fact that they have very small amount revenue too. But the budget management is still not transparent between the D/M councils and board governors. Sometimes, the D/M councils do not know whether D/M board governors use the budget. They both seem unclear about their role and responsibility. 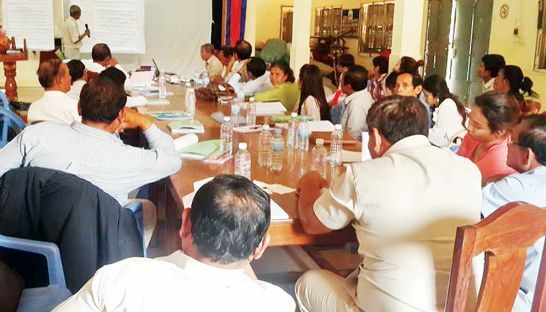 Furthermore, D/M council members are still discriminated between CPP members and CNRP members. “Although I am a council member, I don’t know anything about district administration’s activities of expenditure details. I know only the total expenditure and participated in approval”, said Keo Sareun, a Angkor Chey district council member from CNRP. “I’ve never received any budget for the missions. Sometimes, I cannot even find a space for seat and work”. Rith Hok, a member of Somroung Tong district council members in Kampong Speu, who is also from CNRP, claimed he had same experience. This is a part of the financial reform in the district administration, which should be the accountability of the councils, but now is still politically discriminative. Decentralization in the district level is different from that in the commune level, where it is much easier as it is directly managed by the councils. According to the mid-term evaluation on National Strategic Plan Development by the Ministry of Planning for 2009-2014, D&D Reform could improve the welfare of the people through the construction of roads in the rural areas, and contribute by 10 percent to the percentage goal of poverty reduction set by the government [1 percent per year] (Boret, 2011). While the decentralization on district level plays an important role as the one on the commune level, the government, under the control of the ruling party, could reduce the cost of continuous missions from national level. Keeping this budget for D/M administration for functional assignment activities in order to parallel with D&D reform. In addition, it could provide opportunities for D/M administration to run autonomous finance. As example of one-window service in each Khans of Phnom Penh and other major cities. If their implementations are good, it would draw more attention to the voters. Otherwise, the D&D Reform would be only an illustration, used to cheat for more cash from the donors while not reach the IP3 program. That the reform needs more time is an out-of-date excuse when comparing Cambodia to the other countries in the region such as Indonesia (1998-2000), the Philippines (1990-1991) and Pakistan (2014-2015). It is not “better late than never” for the Kingdom; it just takes too long (OSI, 2015). Previous Post Cambodia cannot reconcile due to internal conflict history?